Tempest at eleven years old is James La Due's youngest student. She uses cushions to see out and reach the pedals while she flys like an ace. Children are natural pilots, ask most certified flight instructors. The sky is a big open playground to a child. 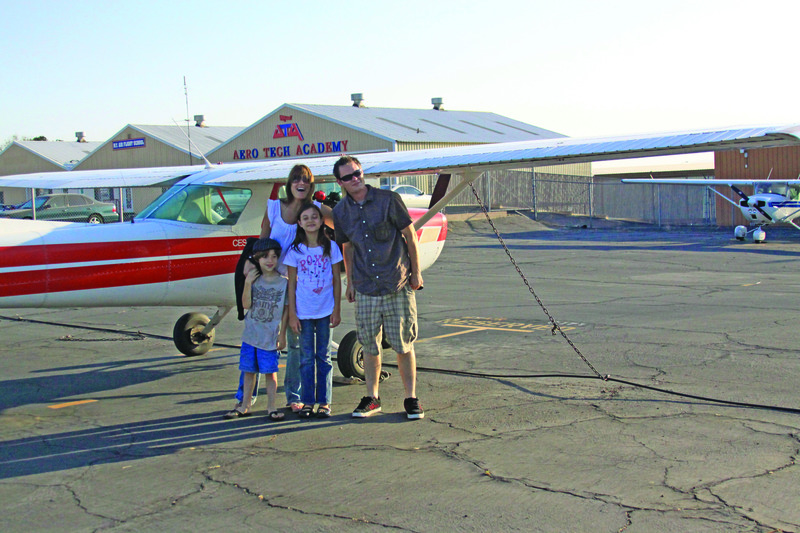 MY Air Flight School at Redlands Municipal Airport currently has three young students from 11 to 15 years old, two boys and a girl, all working toward their private pilot’s license. The youngest member of this prestigious group is the girl, Tempest Evans, 11 years old, who is home schooled. She took her first airplane ride in February and was instantly hooked. She started lessons in May with a shiny new logbook and a truckload of enthusiasm. Her first lesson, on a thick chair pad to lift her small frame higher and farther forward to reach the yoke and rudder petals in the Cessna 152 trainer was a great success. She flew to San Bernardino airport to practice landing on the nearly two mile long runway, then up to altitude for a little maneuvering practice and back to Redlands for three landings. Her instructor, James LaDue, who has taken on the training duties for all three of the young students, announced “She’s a natural”. He said that she was completely without fear and could always tell him precisely which direction Redlands Airport was on the ground. was good for kids she said, “Of course! It’s fun, and I already know how to get to San Bernardino.” She said that if she could talk to other kids about airplanes she’d yell “Go flying!” During the de-briefing she was cautioned about the studying needed for the written portion of the exam and her confidence never wavered as she stood up even taller and announced, “I’ll zip through it.” This is not the reaction of most adult pilot license candidates, but one look at Tempest and it isn’t hard to imagine her climbing into the cockpit of a jumbo jet someday and being addressed at Captain. The other two students studying at MY Air are boys, Matt Miller, 12, a sixth grader from Redlands Christian School and Nick Kanavas,15 years old and an incoming Sophomore from Redlands High School. Matt mows lawns to earn the money for his flying lessons and has a little bit of hesitation each time he hands it over to the school, a carefully smoothed stack of $2o dollar bills, collected for two weeks before each lesson. Lessons run around $100 dollars each including the aircraft rental, fuel and the instructor’s fee. Matt’s goal is to one day be an entrepreneur who flies himself to his ventures. Nick says he wants to fly more than anything and his goal is to be a commercial pilot one day and fly for a living. Both boys land the planes themselves with great precision. One pilot watching the spectacle said “there are guys out here who have been flying for years who will never land that well”. As we were packing up to leave the airport Mr Ngeuyn, a vietnamese immigrant, was waiting for his son, who was taking an airplane ride for his sixteenth birthday, his third airplane ride recently. He had told his dad he really wanted to learn to fly. Knowing that playing in the band at Yucaipa High School was Will’s greatest joy he asked, “Would you be willing to give up band to learn to fly?” The boy had replied, “I give up everything I have to learn to fly.” So the dad vowed that as long as there was work for him, he would provide for his son’s flying lessons. We can all be encouraged to scratch up a little more resources to make our dreams come true. Maybe there’s a little entrepreneur in all of us.